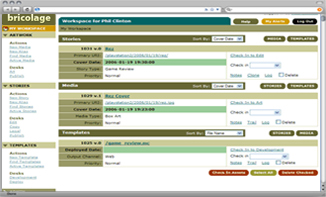 Bricolage CMS -- Open-source, enterprise-class content management. The only web publishing system that doesn't think it's smarter than you are. Stop trying to hack your way out of someone else's paper bag, and start enjoying total freedom. Or, try a virtual machine. 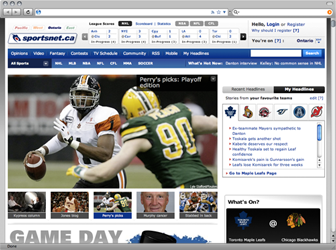 Rogers Sportsnet.ca is powered by Bricolage. 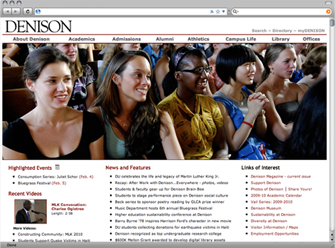 Denison University is powered by Bricolage CMS. 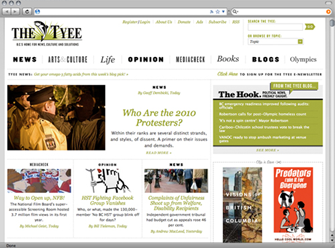 TheTyee.ca is powered by Bricolage CMS. 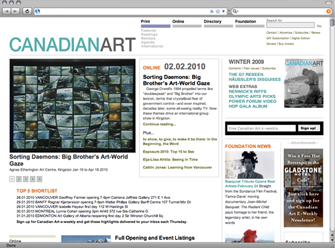 Canadian Art is powered by Bricolage CMS. Bricolage is an open-source, enterprise-class content management, workflow, and publishing system that greatly simplifies the tasks of creating, managing, and publishing vast libraries of content. Bricolage is like a box of magic crayons. Welcome back to the Output Channel: a relatively regular review of what’s shakin’ in the Bricolage ecosystem. If you have submissions or corrections that you’d like to see included in the next issue, please e-mail them to the-oc@bricolagecms.org. The Bricolage development team is pleased to announce that Bricolage 2.0.1 is available for download. This maintenance release contains a wealth of bugfixes and some exciting new features, and it slightly (but elegantly) tweaks the user interface. It's the best Bricolage yet. Bricoleur Matt Rolf shares his experience migrating from Blogger to Bricolage 2.0. He details the installation, content migration, woes and successes of his journey. Long-time Bricoleur Cameron Miller writes in about installing Bricolage on Ubuntu Lucid server. Long-time bricoleur Matthew Rolf reports back from YAPC 2010.